Management has many disciplines. One major discipline is marketing. Some other disciplines are finance, HR, operations, logistics etc. It cannot be said that one is more important than the other. However the changes taking place in the society have brought marketing in focus and there is good demand for marketing professionals all over the world. Renowned management guru Peter Drucker (1909-2005) had said that a business enterprise has two and only two-basic functions - marketing and innovation. Any business which wants to grow has to use the power of marketing. Today's giant corporations have reached this stage with marketing as their major strategy. As consumers we cannot remain oblivious to various marketing efforts directed to us. Most of us know what marketing is, even if we find it difficult to explain. Marketing has been defined in various ways. A simple definition carrying the essence of marketing explains marketing as understanding the needs of customers; designing products and services according to these needs and making these reach the customers. Study of marketing tells us why people buy and why they prefer one brand over the other. After economic liberalization there has been a spread of consumerism in our country. The rising middle income group is driving demand. More and more young people are joining the working population with high disposable income. Consumers have more choices and the world of business is facing unprecedented competition. In this scenario business enterprises are investing heavily into marketing as they have to meet the challenge of retaining their market share and then increase it. All big and mid size companies have a marketing department at corporate level managed generally by people professionally qualified in marketing. There are regional marketing offices and field marketing teams as well. Market Planning: Every business organization needs a detailed marketing plan. This plan takes into account the territory to be covered, features of products or services to be marketed, target customer group, marketing strategies to be adopted and timing of implementing these strategies. Basically it deals with where, what, how, when and to whom of marketing. Market Research: For a market plan to be effective lot of ground work is required which also includes market research. Market research is the study of consumers, their preferences, changes taking place in these preferences, competition and competitors' strategies etc .It also involves data collection and prediction. Simply put market research means understanding the markets and potential available therein. Advertising: Advertising is not new to us. Every day we come across advertisements in newspapers, on television and in social media. All these advertisements are circulated as per marketing strategy. Advertisements have to be appealing and should attract maximum visibility. Advertising begins with an idea which has to be developed. Equally important is media planning which involves identifying media platforms, locations etc. to ensure maximum return on investment. Branding : Marketers adopt branding to strengthen their presence and build identity. Branding distinguishes one product (or service) from the other and also contributes to repeat purchases. Thus the marketer is assured of sales of a certain magnitude. If we study our behaviour as a consumer we can see how we're drawn towards particular brands. While shopping we ask not for soap but for a particular brand of soap. This applies to purchase of packaged food, detergents etc. Sales: There is a misconception that marketing and sales are one and same function. In fact sales is a part of marketing. Marketing includes lot more things which have already been explained. Also where the emphasis is only on sales, it carries a short term approach whereas marketing is done with a long term approach. Of course marketing efforts should result in enhanced sales but that is not the only purpose of marketing. Effective marketing results in sustainability of business. In addition to and as part of the above, marketing requires study of consumer behavior, business communication, customer service, business forecasting, product management and relationship management. Considering the emerging scenario topics like digital marketing and social media marketing have also been included in the syllabus of marketing. In order to have a good career in marketing you require a postgraduate qualification in Management with specialization in marketing. This qualification can be in form of degree or diploma. In very few cases people having a BBA (bachelor of business administration) or BMS (bachelor of management studies) qualification get opportunity to enter a marketing career either at junior positions or with a sales profile. Any person with 10+2 or SSC qualification is eligible to join these graduate courses. In the same fashion all graduates irrespective of the subjects chosen, may apply for a postgraduate course in management. The regular full time course is of two years duration and specialized study happens mostly in the second year. There are specific courses for marketing management run by few institutes with nomenclature as Masters in Marketing Management or Postgraduate Diploma in Marketing Management .The course you choose should have University Grants Commission recognized university affiliation or recognition of All India Council for Technical Education. Nearly all business schools offer courses in Marketing Management. However some of the institutes have a better reputation for programmes offered by them. Indian Institute of Management (IIM), Ahmedabad is one such institute. Next in line are IIMs at Kolkata, Bengaluru, Kozikode, Lucknow, Ranchi and Indore. Newly opened IIMs at Rohtak, Tiruchirapally, Kashipur, Shillong, Udaipur are also good bet. Admission to IIMs is made on the basis of scores in Common Aptitude Test better known as CAT. This CAT score is accepted by most other management institutes. Many states have CAT like tests for admissions to management courses available within the state. For example Department of Technical Education, Government of Maharashtra conducts such examination for courses in Maharashtra based universities and other institutions. Many of the private institutes conduct their own tests. Prominent among these are Xavier Labour Relations Institute, Jamshedpur, Symbiosis Institute of Business Management, Pune, Narsee Monji Institute of Management Studies, Mumbai etc. Few private institutes also accept the score in ATMA conducted by Association of Indian Management Schools and MAT by All India Management Association. Postgraduate courses with specialization in marketing management are available at few of the IITs (Indian Institute of Technology) and NITs (National Institute of Technology) .Indian School of Business (ISB) at Hyderabad and Mohali run a rigorous one year course in (marketing) management. However only candidates with experience are admitted. ISB has not sought AICTE recognition. But the quality of its education is internationally recognized. 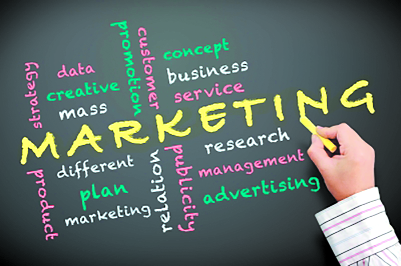 Marketing Management has sub specializations like rural marketing, international marketing, agri business marketing etc. offered at specific institutes. FMCG Sector: FMCG Fast moving consumer goods form a major sector of the economy. These consumer goods are used by all sections of people and are in great demand. Also there are more players offering similar products so there is intense competition with need of continuous innovation. Big players in this segment heavily rely on their marketing team for their success. Multinational companies like Hindustan Unilever, Proctor & Gamble, Nestle, Colgate Palmolive, Pepsi, Coca-Cola and home grown companies like Amul, Godrej Industries, ITC, Marico, Dabur, Patanjali are the biggest among FMCG companies operating in India. BFSI Sector: BFSI sector consists of Banking, Financial services and Insurance companies. We see enough vibrancy in this sector as business of such companies is increasing. With your marketing qualification you can join a public sector bank either as a specialist or general banking officer .Private sector banks and insurance companies need marketing professionals to drive their business. You must have read that insurance is a matter of solicitation which emphasizes importance of marketing in insurance business. Others in this segment are mutual funds, stock broking firms, housing finance companies etc. Advertising & Market Research: At advertising agencies the team consists of copy writers, visualisers and marketing professionals among others. Inputs of marketing professionals are considered crucial in formulating any advertising strategy or campaign. Market research is also to be done before launching an advertising campaign. There are companies which are in the exclusive domain of market research. These get paid by clients who seek research inputs from them. These fields require dynamic and creative marketing professionals. Education: As there are large number of management institutes both in India and abroad, teaching opportunities are available in plenty. As a fresher you have less chance of being chosen for teaching assignment. With few years' industry experience and/or a Ph.D. qualification, it is easier to get a faculty position. Dr Jagdish Seth and Prof Nirmalya Kumar are two examples of professors of marketing who teach at prestigious universities abroad. Consulting: In order to increase their business, extend their reach and explore new opportunities many business organizations look for advice of experts. There are consulting agencies and individual consultants who provide such service for a fee. Demand for such consulting services is on increase. But such career is available only in big cities. Marketing personnels are also required in telecommunication, healthcare, automobile, textile, hospitality, petrochemical industries, Information Technology (hardware and software), real estate companies and export organizations. Facebook, Google and Linkedin and E commerce companies like Amazon, Flipkart, Snapdeal have also marketing professionals in their business teams. Joining a startup is one of the options. In many cases recruitment of marketing personnels happens through campus placements. Alternative channels are job portals, social media and newspaper advertisements .Data shows that private sector has more opportunities for marketing professionals. A marketing job is more suitable for persons who are outgoing, persistent and target oriented. For pursuing a management course it is always advisable to choose an established institution with adequate infrastructure and reasonable fee over newly established centers which not only charge higher fee but whose credentials are yet to be proved.